After forming the previous year, Apple had already passed several important milestones by April 1977. The company had seen one of its three co-founders quit, launched its first computer and officially incorporated. However, the 1977 West Coast Computer Faire served as a massive “coming out” party for Apple. This event featured all the big players in the burgeoning PC industry. In the days before the internet, it drew thousands of interested customers — many of whom became early tech devotees. Apple showed off its new corporate logo at the computer fair for one of the first times. The multicolored design by Rob Janoff featured the outline of an apple with a bite taken out of it. The instantly iconic symbol replaced an earlier Apple logo by former Apple co-founder Ron Wayne). Apple occupied the four booths directly facing the building’s front entrance. The strategic positioning made Apple the first of 175 companies at the Faire that visitors saw when they arrived. At a time when money was short, Apple splashed out on a backlit Plexiglass display featuring the new logo. The eye-catching setup showcased a dozen Apple II computers. Unbeknownst to customers, these were unfinished prototypes, since the actual computers wouldn’t be ready until June. Apple’s second computer became an enormously important product line. 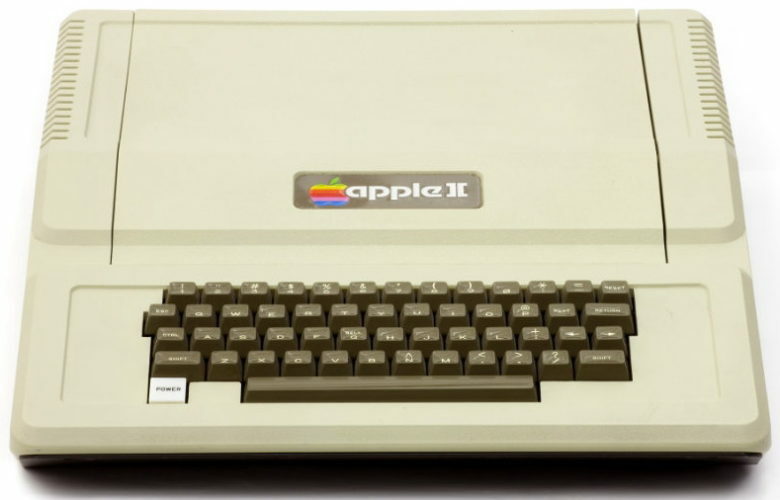 The year of the Apple II debut, the machine brought in $770,000 in revenue. That figure increased to $7.9 million the following year and a massive $49 million the year after that. Apple continued producing some version of the Apple II until the early 1990s. This computer brought a number of important players into the world of high tech, including Mitch Kapor, founder of Lotus Development Corporation and co-founder of the Electronic Frontier Foundation, and John Carmack, the legendary coder behind smash-hit games Wolfenstein 3D, Doom and Quake. The Apple II also queued up Cupertino’s first “killer app” — spreadsheet program VisiCalc. While Apple later moved away from the Apple II product line (much to the annoyance of co-founder Steve Wozniak), this computer put Cupertino on the map. And the Apple II launch at the West Coast Computer Faire gave the world its first glimpse of the innovative machine.